We have LOVED The Pretty Blog ever since they launched their pretty blog in 2010. You could even say that they were one of the inspirations to start our blog. A good friend of ours from Joburg met Christine Meintjes, co-founder of The Pretty Blog, last year and when mentioning that her friends Filipa and Kim ran a wedding blog based in Durban, Christine replied by saying that she knew about us and had seen our stuff on Ruby+Swallow! She may not remember that, but well, let's just put it out there that it's an understatement to say that we were THRILLED. We waited in anticipation for the 8th August this year, when the all-new The Pretty Blog was due to launch. We speculated at what they could be doing and changing on their blog, and what their readers could expect. And certainly, when they launched, the Ruby Team was not even slightly disappointed! When The Pretty Blog asked us to introduce their new site to our blog readers, our first thought was: "Us? Really?!". We're pretty sure all of you Rubies already read The Pretty Blog daily - who doesn't? But if perhaps, you haven't seen their pretty new look - you should. The new website is now not only dedicated to weddings, but everything before, after and in between! Their lifestyle articles were such a success after they launched that today, The Pretty Blog's new website is now made up of five awesome sections: Wedding, Food & Wine, Style & Home, Family & Kids and Travel. Besides re-structuring and categorising their content, the website has a fresher and cleaner appearance, making space for photography and design - which we adore! It's bang on trend, with a contemporary and more editorial feel. The clean lines and open space allows the content to breathe - and like any good website or blog, this is so important. 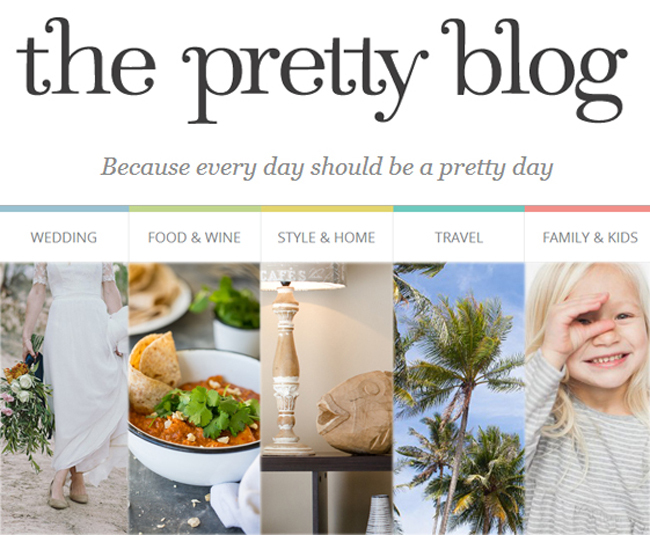 So, The Pretty Blog has five amazing lifestyle categories and a beautiful new design. But there's more! This clever little team is also allowing readers to personalise their experience, making the website a little social media hub of it's own. We can now create our own profiles on "My Pretty Things", and from there we can choose the articles that we'd like to see more of. If you're a young bride-to-be, you can choose to view all the Wedding content, while the married women with little bundles of joy can see more of the Family & Kids section. Have you ever gone onto their site and wanted to save every dress/ring/cake/table decor/cake topper you saw? Now it's so easy, because you can save all the pretty articles onto your own profile and refer back to them whenever you like. We just can't choose which section we love the most! We just love The Pretty Blog's story. Christine Meintjes and Nicola Pretorius envisioned a website that would not only inspire brides, but also inspire women in every aspect of their lives. From a few blog posts a week, just look where they are now. With a team of eight people (you can meet them here), they are inspiring South Africa and the world. So go on, and have a look at this gorgeous site. Because every day should be a pretty day! All images credited to the photographer below the image.